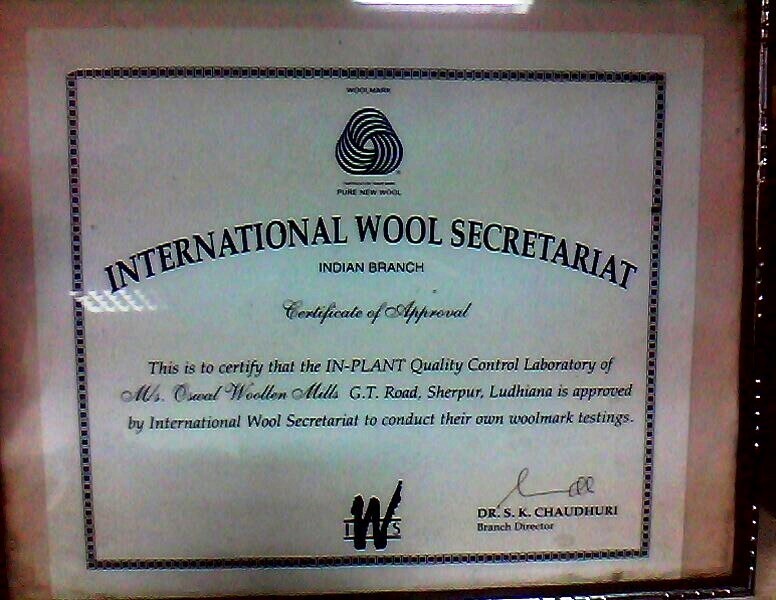 WE ARE OWNER OF BRAND ‘OWM’, UNDER WHICH WE SELL OUR WIDE RANGE OF YARNS. We are registered licensee of ‘ Woolmark ’ for our Woollen Hosiery Products. Woolmark is the certification trademark for products made from pure new wool, which meets certain quality standards laid down by the Woolmark Company.. Woolmark and other trademarks of the Woolmark Company can be used by a company on obtaining a license. The products need to be able to meet the quality standards demanded by the Woolmark programme, such as, maintaining consistent high quality. 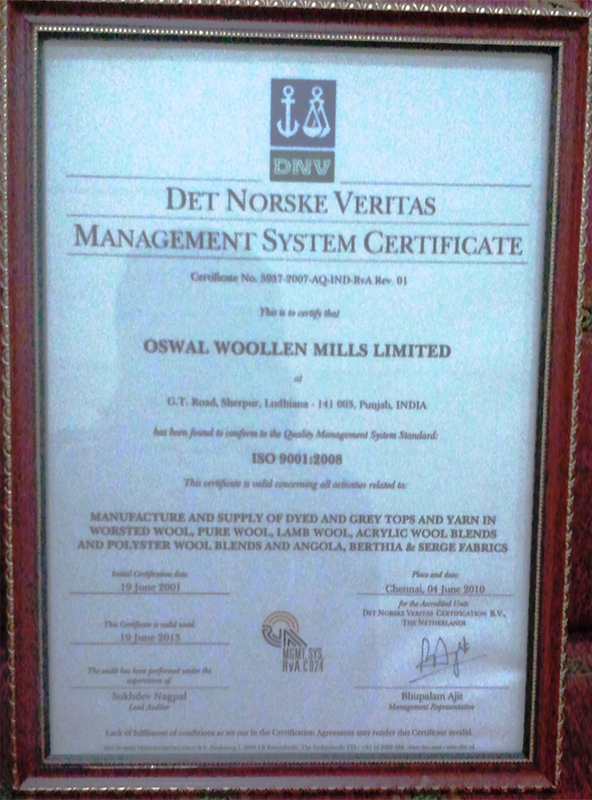 A licensee’s of Woolmark, is entitled to the following benefits: The Quality Management System of our Company has been certified to conform to the Quality Management System Standard: ISO 9001:2008 by DNV Certification B.V., the Netherlands for the manufacture and supply of dyed and grey tops and yarn in worsted wool, pure wool, lamb wool, acrylic wool blends and polyester wool blends and Angola, berthia and serge fabrics. The original certificate was valid from June 19, 2001 to June 19, 2004, which has been further extended till June 19, 2007. 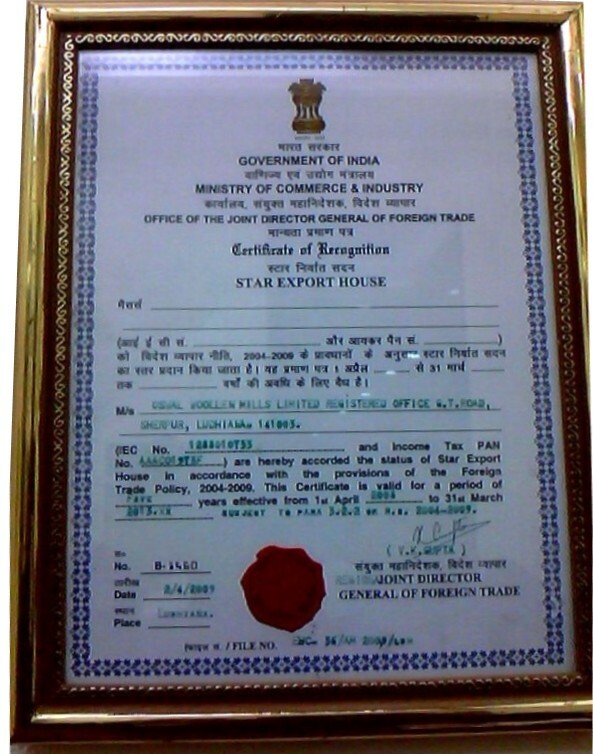 We have been accorded Export house status by Joint DGFT Ludhiana on 2008. 1949 Our Company was incorporated as a public limited company with a woollen hosiery knitwear unit, a worsted spinning plant, barrack blanket weaving and finishing plant at Unit No.1 at Miller Ganj, Ludhiana. 1950 First worsted spinning plant at Unit I, G.T Road, Miller Ganj, Ludhiana. 1960 Set up Unit No.III at G.T.Road, Sherpur, Ludhiana for combing spinning dyeing, weaving and processing. 1968 Commenced export of knitted hosiery. 1969 Set up a Vanaspati manufacturing plant under brand name DARBAR at Unit No.III, G.T.Road, Sherpur, Ludhiana. 1972 Set up Unit V at Industrial Area 'A', Ludhiana for manufacturing woollen hosiery knitwear. 1973 Set up a new vanaspati plant at Chennai, Tamil Nadu. 1974-85 • Launched our 'Monte Carlo' brands. • Established an OWM Export House. • Received recognition as an Export House under the EXIM Policy. • Recognized as one of the first five "Trading House" under the EXIM Policy 1981-82. • Outbreak of fire at our office at G.T. Road, Miller Ganj, Ludhiana 1993 Set up Unit IV at G.T Road, Ludhiana, a lambs wool plant, to produce high value, fine micron lambs wool yarn for top class knitwear's. 1995 Launched our 'Canterbury' brand 1998 Closed our vanaspati and vegetable oil unit at Chennai and Ludhiana. 2002 Extended the application of "Monte Carlo" brand to cotton segment. 2004 Commenced operations for augmentation and up-gradation of spinning and knitting capacities started at Unit III. 2005 Operationalised the co-generation captive power plant of 3.5 MW capacity at Unit III. The first phase of the denim plant at Lalru, Punjab was commissioned in 2006. The denim spinning plant at Lalru, Punjab was commissioned in 2007. The first phase of Solar Plant was commissioned at Jodhpur, Rajasthan in 2011. The first phase of Wind Plant was commissioned at Karnataka in 2011.